Here is the package for the Special Collector's Crate re-issue of the "ELV1S 30 #31 Hits" compilation. The CD contains the standard 31 songs as previous releases of this compilation. CD+ T-Shirt+Crate= Must Have Fan Pack! With a CD, artist t-shirt and custom storage crate, each Limited Edition Collector's Crates package is a fun-filled fan experience that's priced right and time perfectly for the 2009 holiday gift-giving season! Nobody is obliged to buy this item. It is just a gimmick to continue selling a product that has been available for quite a while. I would not be surprised if it was to be repackaged in a tin can (& a new candle !) for xmas ( & that's only an option !). 'True fans' - crate collectors? next year we'll get a remastered crate out of the best plastic ever...ah, what about a nice addtional roll of wastebags? And dont forget Harvey, the most sales from a product like this are not going to be from 'newbies' but from fans that already have these songs a billion times over. I dont know if I'd call them loonies or suckers, just ;strange' for wanting to buy this because of a crate or t-shirt when as you say, there are many qualiity products out there. The 69 Vegas book is about the best product to come out this year. It's really worth having if you are a fan. But one quality product like that equals about 10 crappy products in ratio. It's sad. It has nothing to do with name calling, Ruthie. I'm just stating the facts. There are (and always have been) the 'normal' people and the 'loons'. The 'loons' are the ones who buy pap like this, which in turns means that such pap continues to be churned out. If the 'loons' did't buy it, it wouldn't come out. The 'normal' fans are the ones who buy the quality stuff and wouldn't touch garbage like this with a barge pole. By quality stuff I mean things like the new 'Vegas '69' book or the FTD releases. The 'loons' would rather go for crates with t-shirts in them. That's why there's so much garbage in the Elvis World. The company (& the Colonel) has made Elvis products for the last 30 some odd years that have made a joke of what Elvis stood for in music. Have we forgotten the Elvis garbage can from Boxcar, Elvis wine, countless compilations, etc? The marketing of Elvis (especially after 1977) rivals no one in bad taste. The company is making a joke of Elvis. A crate & teashirt? Who else gets this treatment? Somewhere the Col. is looking up & laughing with PT Barnum. For heaven's crate, uh I mean sake, just let people with an exclusive taste buy this fan pack! Nothing wrong with it..
Just to clarify: You didn't read what I wrote. I never said I have a problem with different opinions. That is the reason for this forum. I simply stated I have a problem with resorting to name calling by those who feel everyone should think like they do. If you already have the music & you wouldn't buy it, that's fine. Most of us have just about everything. This stuff isn't marketed for us. There is always a new market or group out there & you'd better offer something to catch the eye with all the competition. It's also called free enterprise or to quote my old Economics instructor, it's all about money. No one is making you spend yours. Well, you can revert to your childish name calling all you want. This particular loon & sucker has the music & wouldn't buy it either. However, if this stupid consumer was attracted to an Elvis CD for the first time, I may very well buy it (not having all of your expertise & knowledge). As a matter of fact, I have bought CD's & books I never would have noticed if it wasn't for the packaging. Don't be so critical - the world doesn't revolve around you or your taste in music - thankfully. Some people will buy ANYTHING. That's why EPE loves the loons. 1) A CD that you've probably already got. 2) A t-shirt that you could probably buy cheaper elsewhere. 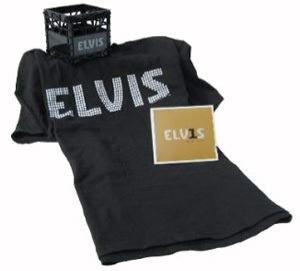 3) A plastic crate with Elvis' name on it. For what? "Gee, look at me! I've got a plastic crate with Elvis' name on it! Tomorrow I'm going to buy a commemorative plate because you get a free cardboard cut-out of Graceland with it. Next week I'm getting sectioned." Steve V, What they don't get this is not an indictement against Elvis but the greed the companies are showing, and the hubress shown towards the fans. But then maybe it's a good thing , you know helping out the economy. By the way what is the crate for? Is it a nicknack? Do you store your Elvis cd's in it? What if you accidently put a non Elvis cd in it? Does it come with an alarm?This is why many considers the Elvis fans to be a laughingstock. And I'm a fan. But this is just a marketing ploy. Right now they are thinking of other schemes (maybe a fishbowl or the like) to repackage it in a another year. Yeh, like I said there are plenty of suckers around. Thanks for making my point. I agree with Ruthie too. If it ever came my way I'd buy it. Sure I've got all the music, but by the same token everyone who buys every concert is buying the same songs over and over again. Different things suit different folk. More Importanly, if one newcommer to Elvis' music buys it then surely its worth being out there? Not suckers just folk who like different things. Jesse - Of course the CD is platinum. It sold tons years ago when it came out. But its a different world today. CDs dont sell. If this crate makes it sell more, fine. I dont see the negativity when people are stating the obvious. It is a marketing ploy to keep it selling if possible, nothing more. And Ruthie, if this was a 100% postive site about every product, every song, every concert Elvis gave, what would be the point for folks to express their opinion? It would be a pretty boring site. I like to hear people's different opinion and not see everything Elvis did as 100% great(which is the case). There are probably other sites to go to if you require that. better than a duck though - quack! crate seems a bit small though, i was expecting a huge thing for all my elvis Cd's! very well said Ruthie, very well. Well, it certainly didn't take long for this site to be back up & running (for which we are so glad) before the reguar "whinners & complainers" to start in again. Just because you already have the music & have had it for years is no reason someone else shouldn't buy it. I happened to see this CD crate set in one of our local Target stores. I didn't buy it because I already have it but I did notice a couple people purchasing it. Whether they bought it for the music or for the packaging should be of no concern to you or me. They bought it because they wanted to. It's their money, not yours or mine. What they purchase doesn't make them stupid or any of the other adjectives you probably have for them. It's their money & their business. If it introduces Elvis to new people, that is what should count. Strictly for suckers. And there are plenty of those around. Pap, pap, pap for the lunatic fringe to buy - the ones EPE love so dearly. Buy one today and help pay for Cilla's next facelift. Just don't go expecting a deluxe DVD release of 'Elvis In Concert' because they can sell far more copies of pap like this. Roll up! Roll up! Get your pap here and help make Elvis a laughing stock. Ive seen these types of packages in stores. Its gimmicky marketing to sell CDs which cant seem to sell much on their own anymore. After all, you cant get a T-shirt from iTunes. So the morale seems to be, if you want a fun filled life - get yourself a crate!! If anyone wants to get me a crate - please fill it with beer. Recently there was a Bob Dylan CD packaged in the same manner = CD, T-shirt & crate. However, the crate was made of a very cheap grade of plastic. Hopefully, the Elvis crate will be better. (Probably not). Yes, but I already have two versions of the CD (Digipack and DVD-Audio) so can I have the T-Shirt and the crate for free? Thought so!! well that is what we call good taste.. Yet another rip-off to scam loot from the loons.